Working in conjunction with the FabriVISION machine, FabriVISION software maximizes the throughput of your turrets and lasers by eliminating delays in the inspection process. The key to quality fabrication is building quality control into the production process. FabriVISION provides a consistent, reliable inspection process while increasing your shop’s productivity. 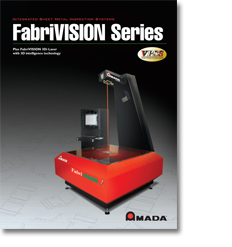 For quality conscious sheet metal fabricators who strive to stay ahead of their competition, FabriVISION will increase the performance, productivity and profitability of your fabrication operations. Our Order Desks are open from 5am PST to 5pm PST. Enter your ZIP code to locate a sales representative in your area. The Foundation of the Fabricators & Manufacturers Association, Intl. Copyright © 2018 AMADA AMERICA, INC. All Rights Reserved.